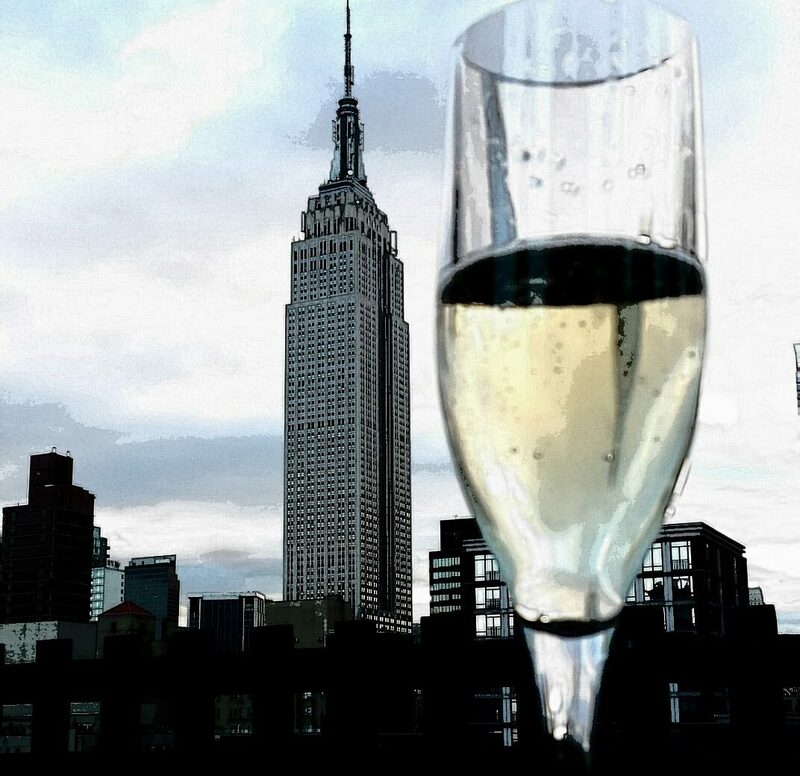 A tale of Italian food and wine pairing, past and present! 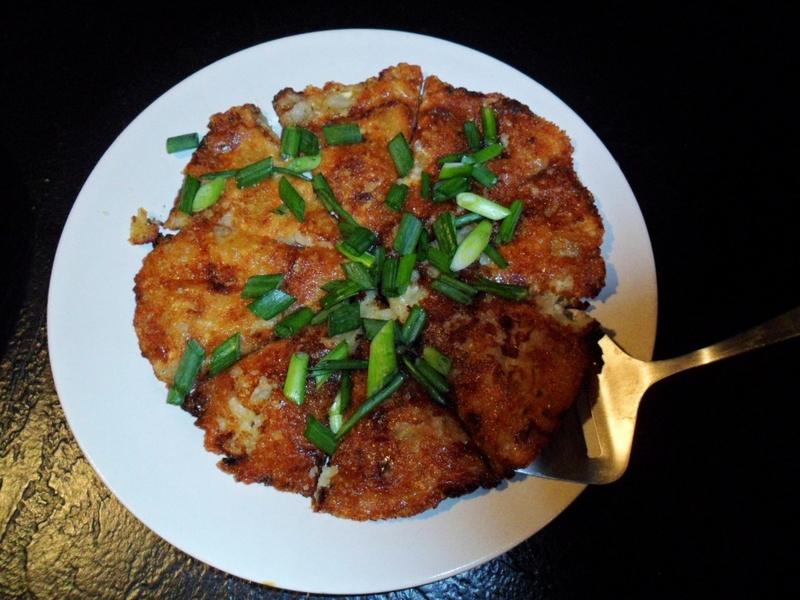 Recipe for Frico! You’ve got to hand it to the Italians, they know how to entertain. One of my first foodie memories is visiting my Uncle’s Italian family for Sunday dinner. I watched in amazement as his sisters tirelessly prepared yards of fresh pasta, paper thin fried eggplant, giant trays of misto and a main course of rabbit for scores of friends and relatives. The adults washed down our feast with glasses of homemade wine (each family had their own barrel) or Chianti poured from the straw covered bottles so popular in the 60’s, I was even allowed a sip or two on this special occasion. I loved this dinner! The wonderful aromas of our meal together coupled with after dinner tales and laughter put a smile on my face. The warmth and welcoming nature of these people was infectious! Dinner with other branches of my family paled in comparison. How could I ever tolerate days of bland funky meatloaf, simple roast beef or only milk with my meal ever again? Thankfully we did visit my uncle’s family again but not often enough for my adolescent curiosity into this foreign culture. This year I had the opportunity to tour the wine region of Friuli Venezia Giulia on a post trip with the EWBC. Looking forward to discovering first hand the people, wine and food culture I couldn’t help but to think of my Uncle’s family and all of the fond memories of my first glimpse into Italian cuisine and wine. I had been to Italy before but remember little else but the dreamy eyes of a young artist I fell madly in love with on my first visit, not even an Italian. I wondered, would I fall in love again? Well I did fall, hard, but for the amazing wine, food and people of Friuli! In particular I found one unusual red wine and a cheesy potato dish swoon worthy! My first day in Friuli was packed with vineyard visits. Before dinner I had the opportunity to taste some additional wines with several vintners. This special intimate tasting was set up in a walk around format with each winemaker only showcasing 2 to 3 wines. I found myself drawn to the reds made from the rare red grape Schioppettino very interesting. Schioppettino, also known as Ribolla Nera is one of the most interesting red varietals of the Friuli wine world. This indigenous grape has a fascinating history, changing from local criminal to indie rock star in a little over 40 years. 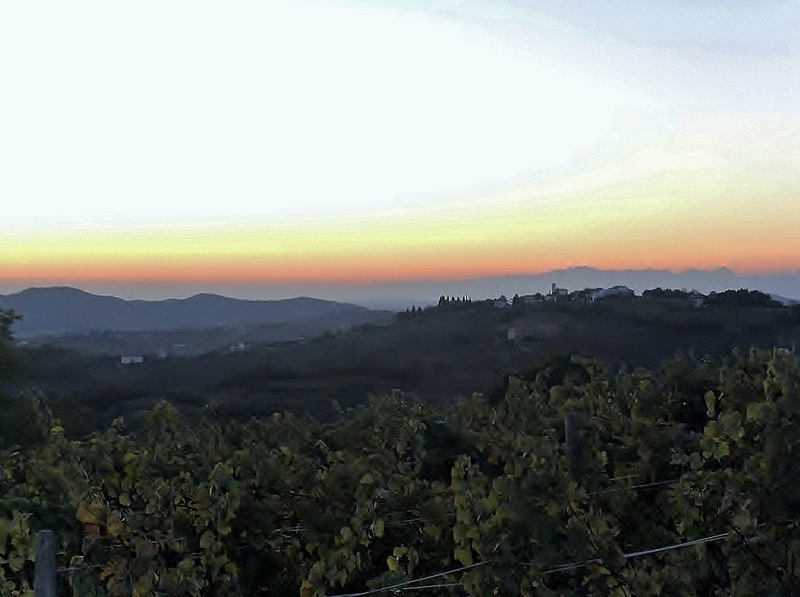 At one time Schioppettino was virtually extinct, less than one hundred vines remained. Two factors lead to its near demise, disease in the form of phylloxera and favor of international varieties such as Cabernet and Merlot. Such was the demand for international varieties that this indigenous grape was almost abandoned. Planting Schioppettino was banned as it was classified as an illegal varietal. In 1978 a European Union decree authorized its cultivation in the province of Udine that saved Schioppettino from an untimely death. Today it is still planted in limited quantities around the villages of Prepotto and Albana, considered to be it’s elective home. Hopefully this grape has a bright future as it makes a delicious perfumed, medium-bodied red with a hint of spice and the capacity to age. The best examples I tasted possessed an edgy feminine side with a heady perfume, a bit of a naughty vixen of a wine. It can also have a bit of an acidic pop on the finish that makes it an excellent food friendly find. Schioppettino literally translates to “little crack” for the sound it makes upon opening. My favorite Schioppettino of the night was from Borgo Conventi. This wine had subtle aromas of violet with a silky mouth feel. 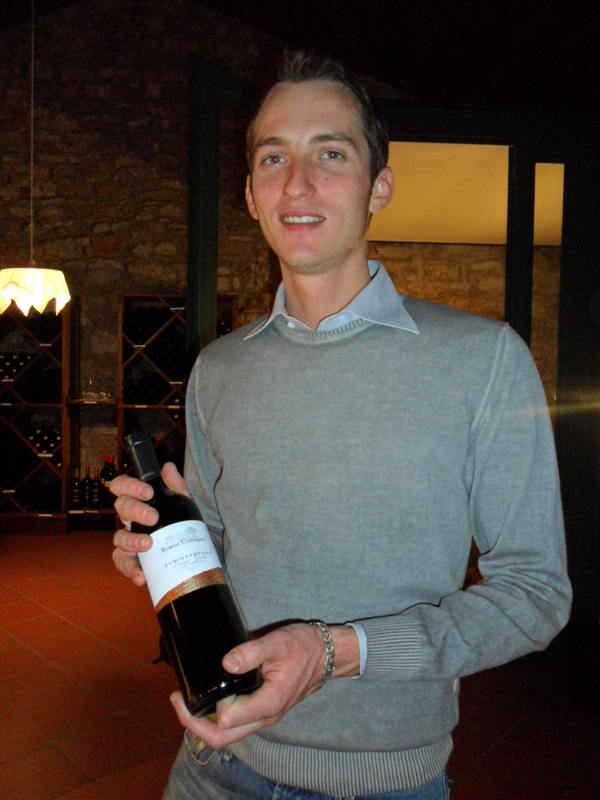 The young man representing this estate owned by Ruffino in Collio Goriziano was thrilled to have representatives from so many countries tasting his wines. As I talked with him he was very happy to share his passion for the region and how much he was looking forward to hosting us at a dinner the following evening. Given a choice of numerous wines at his estate I chose his Schioppettino to pair with my dinner..
With my love of cheese I was curious about a regional dish called Frico. Prepared either as just a crispy cheese wafer or pancake style with potatoes it’s delicious! The crispy wafer type is available always with the potato version reserved for colder months. I was lucky enough to find the potato version in a little wine bar in Treiste. Let me suffice to say it was love at first bite! One pound of finely shredded cheese, melted till golden brown and crisp with a soft potato center had me getting my frico on! It was worth searching out , so damn good! Here’s my recipe formulated after a bit of trail and error, give it a whirl! Boil potatoes in their skins till just fork tender, drain, chill in fridge or cold water. Peel and slice into thin rounds. Set aside to further cool. Saute onions in olive oil till translucent in non stick skillet, add potatoes, salt, pepper and saute with onion till they begin to brown. Remove to shallow bowl and mix in goat cheese crumbles, be careful not to mix to well, just till loosely incorporated. Sprinkle half of shredded cheese into bottom of skillet on medium heat and top with potatoes mixture pressing down to form flat disk. Slide onto plate and invert or flip uncooked side into skillet from plate. Brown till golden and slice into 8 pieces to serve, garnish with sliced scallion. Note- It took me a few flips to reach desired crispness, have patience it turns out crazy good! 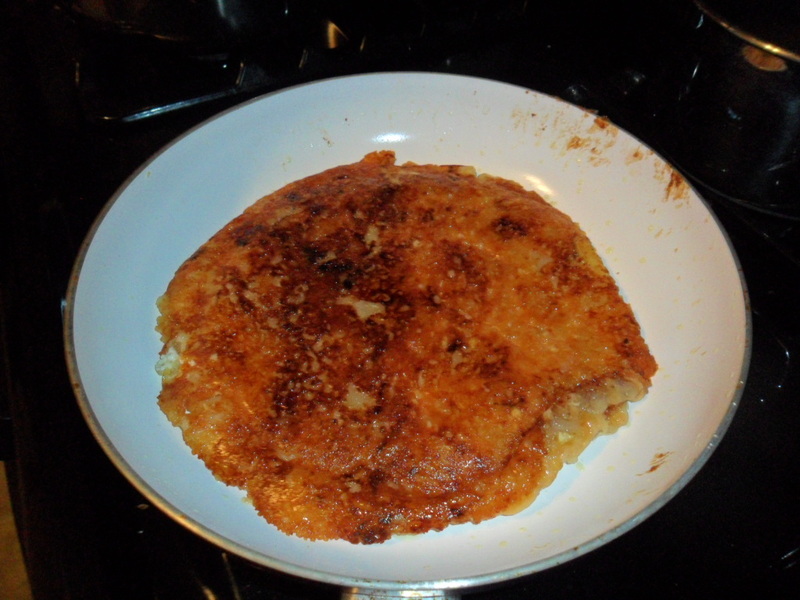 I just recently discovered Schippettino and am looking forwrd to trying your Frico wih it. Frico is delicious! For spring you could serve it with arugula salad and have a light meal!